Handmade, 100% real flower curio picture features a red potentilla, biden petals, hydrangea petals with coral bells and queen-ann's-lace for accent. Makes an everlasting keepsake or special gift. Flowers are mounted on an acrylic easel display and have been covered for protection. 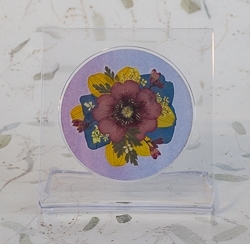 The flower arrangement area is 2 1/4" diameter, and the easel is approx. 2 7/8" wide by 3" tall by 1 3/4" deep. Includes separate information slip about what flowers are included and what makes this so special. One-of-a-kind, what you see is what you get. Note: Available in quantity of one.